Afflicted from birth with a condition known as “ultra sound sensitivity”, Lila Rose was fated to have a significant connection with music. Thankfully, she was also born with a natural vocal talent that she developed into a versatile, soulful, and deeply expressive instrument. Embarking on her music career seven years ago, the Toronto-native recorded two singles with producer Pete Prilesnik (Ashley MacIsaac, Sarah Harmer) which earned her some well-deserved attention. It wasn’t until 2008, however, that a small tour of Northern California would lead Rose to find her second home and the launching point for the next phase of her career: San Francisco. 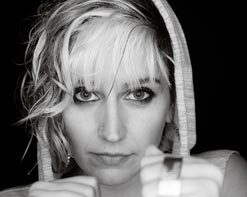 It was there in 2009 that she released her first EP, Osmos Your Sonica, as well as her critically-acclaimed debut full-length Heart Machine in 2012. Just last year, the East Bay Express named her “Best Bay Area Musician”. In this nurturing and supportive climate, Rose recently completed her second full-length album, WE.ANIMALS, produced with band member Daniel Garcia, and we now have its first darkly compelling single. HIP Video Promo is very pleased to present the mysterious and mildly unsettling video for “Confessions”. “Confessions” is all warm analog, featuring slow guitar arpeggios, drums, and handclaps, ornamented with the unique sound of the African thumb harp. The vocal production is simple, haunting, and very affecting. The song demonstrates her versatility and her keen ability to create a killer hook. “Confessions” draws you in and doesn’t let go until its final note. Both the video and song are a call to action, to witness our current state and the connection/disconnection we have with our surrounding environment. “Confessions” shows us how we have distanced ourselves from the things which matter most by creating a highly plastic based world. Rose says, “I am down on my knees, begging for forgiveness, on behalf of humanity, for all of the destruction we have created, which will in the end be our own demise if we do not find a way to live in accordance with the natural world.” Directed by her fellow bandmate and co-producer Daniel Garcia, the mesmerizing videos was filmed in its entirety in Guatemala – full of imagery both strange and unsettling. In it, Rose slowly and quietly walks in a forest by the light of the moon and comes upon an old rotary telephone lying in the grass. She kneels beside it, and picks it up as the beat begins. She dials and sings into the receiver. We are then taken to a terrifying scene, featuring Rose dressed in a hooded cloak made of plastic film. Her hair is very long and black. Behind her, there are several people alive and bound to trees with layers upon layers of plastic film. They slowly squirm until suddenly frees them all, and they run through the moonlit forest, naked and possessed. The scene returns to Rose on the telephone, but this video purposely poses more questions than answers. Is someone on the other end of the line? What is she confessing to? Are Rose’s two characters the same person? What magic is at work here? Regardless, this video is very satisfying in its dark mystery, and is guaranteed to hold your rapt attention. For more information on the talented and mesmerizing Lila Rose and the haunted clip for her newest single “Confessions”, please contact Andy Gesner at (732) 613-1779 or e-mail the HIP Video Promo staff at info@HIPVideoPromo.com . You can also visit for more info on Lila Rose.